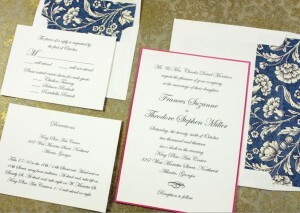 Can a store-bought wedding invitation be changed up for ten different looks? And can it be accomplished on a budget? You bet! 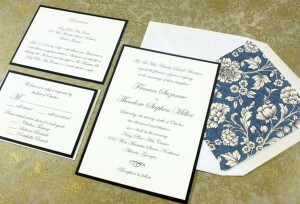 Using simple and inexpensive ideas, a standard invitation package was transformed into ten unique, stylish versions. This DIY invitation comes to us from Shelly and Megan, the creative mother/daughter team who founded online retailer, Paper Mojo. For this makeover, Shelly used a classic Rossi patterned decorative sheet from the Flowers collection (TSC 027). #1 Add an envelope liner. Our invitation came with a square flap envelope. All it takes is one square of cut paper and double-sided tape to secure the liner. With the extra paper, we added a wide belly band, holding all the pieces together, neat and tidy. #2 Add a Fuscia backer card. The purchased invitation is actually a little smaller than 5” x 7” (4.875” x 6.878”), making it easy to add a standard size backer card. #3 Add drama with black. 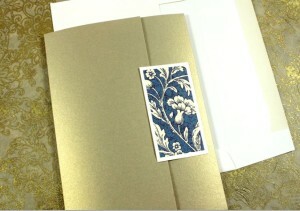 Adding black backer sheets provides a thicker border and focuses the eye on the invite copy. #4 Create a package by laminating to the Rossi paper. Add a black cord tie and tag. Who doesn’t love to open a package! #5 Adding a fancy pocket organizes the content – response card, directions, etc.. especially if you prefer to keep the front side completely original. #6 Add the Rossi sheet to the back of the invitation, directions and response card and tie the bundle together with a coordinating ribbon. 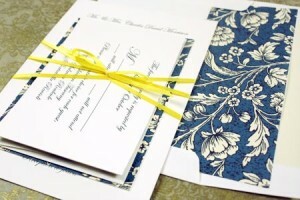 This is another good way to introduce color and pattern into your invitation. 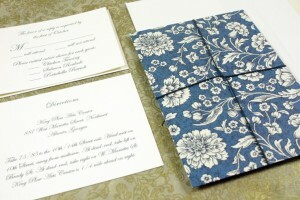 #7 Create a gatefold by placing the invite on larger paper – 5 x 7- then scoring and folding the sides. Add a bellyband and secure with an elegant monogram tag. 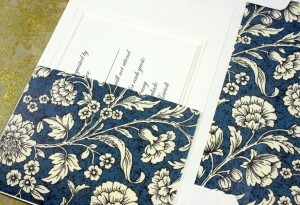 #8 Add a contrasting color envelope and backer card for a country look. 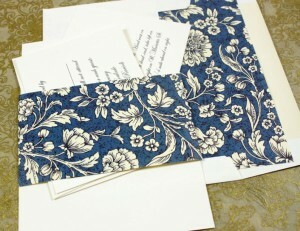 Switch the envelope to a pointed flap and you have a completely different look. 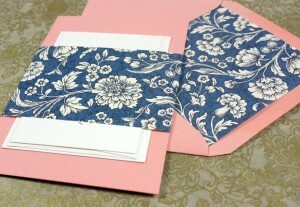 #9 Use a bit of origami style folding to create a decorative paper closure on a folded card. 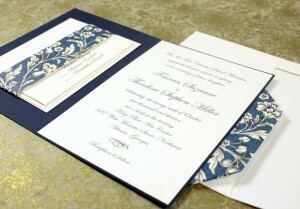 The result looks elegant and classic and holds the invitation together in a unique way. 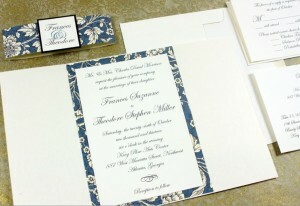 Inside, a simple band secures the invitation enclosures. #10 Add elegance with a pocket fold invitation jacket. 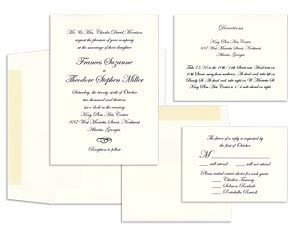 They’re available in a variety of sizes and shapes so a standard size invitation will nicely fill the center panel. The pocket fold is lined like an envelope and the outside gets a layered seal, allowing it to easily open and close. Shelly says that most of these ideas work well for a beginner paper crafter and require only basic paper crafting tools like scissors and paper cutter or trimmer. What’s truly amazing is the affordability …. usually only a few dollars to completely transform the look. Want to learn more? Shelly provides detailed instructions, a cost breakdown, and additional photos on the Paper Mojo website.